The evening started with a performance from the senior band, conducted by Michael Maher. The band, fresh from their second place finish at the National Championships, opened the concert in traditional fashion with the march Slaidburn before featuring the younger members of the band in Andrew Lloyd Webber’s Whistle Down the Wind. Their program was wrapped up with typically enthusiastic performances of the James Bond Collection and Elvis Presley's American Trilogy. Next to take to the stage was the percussion class under the guidance of Padraic Gilchrist and Peadar Townsend. The class brought the house down with some fantastic kit and snare drum playing, with Andrea Murray in particular performing brilliantly. This was followed by the beginner brass class taught by Seanai Conlan. It was this group's stage debut but there were no nerves in sight as they produced a lovely performance of West Side Story - One Hand, One Heart. Next on stage was Sarah Flood's Grade 1 class who executed a tricky program fantastically well, with Eastenders proving a real crowd favourite. The Grade 2 class under the baton of Anthony Murphy and Aoife Crowley showed the senior band how to wow the crowd as they took to the stage in full tuxedos to play James Bond. They were followed by the final two classes; these students are on the verge of the senior band and their hours of practice showed as they produced an exciting performance of 633 Squadron and a lovely version of A Little Prayer. The latter piece was led by Grace Cassidy who played beautifully on the night. The concert finished with a program from the Youth Band which consists of all the players in the grade classes playing full band arrangements. 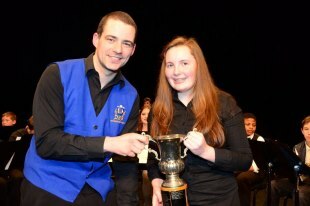 Under the guidance of Stephen Murray the band produced really classy performances of Concert Overture and The Hollyhedge March before the Director of the School of Music, Barry Maher, presented Aishling Reilly with the Student of the Year trophy. 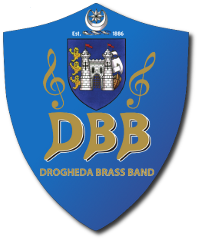 Aishling’s dedication to her playing in bothe the Senior and the Youth bands has been exemplary and she was richly deserving of her award. The concert closed with a spectacular performance of Psy’s Gangnam Style!